Dandruff doesn’t impair your bodily function, but it can be very bothersome and embarrassing. It is also considered as a sign of poor hygiene or ill-health. This, however, is not true. What is dandruff? Normally the scalp skin cells are constantly repairing and renewing themselves. The old cells are pushed out to the surface and they get cleared off when you wash your hair. For people with dandruff, the turnover of cells is unusually fast. This results in excess skin being shed, making the flakes visible. There is also some underlying inflammation going on that makes the scalp red and itchy. The exact cause of dandruff remains unknown and hence it becomes tricky to address this issue. There are many speculations about its cause – water hardness, stress, yeasts infestation, harsh shampoos, poor diet, stomach ailments, sedentary lifestyle. Despite, once it happens, dandruff can be really difficult to get rid off and it can sit on the scalp for years without showing any sign of budging. I have suffered from dandruff occasionally. Only recently I was advised on putting a concoction of coconut oil and fresh amla juice. This mix literally works miracles. Most of the time just one application is sufficient to ward-off, even stubborn, dandruff. This remedy was recommended by my beautician mother-in-law who has many such tips to share. However, this has been the best suggestion so far :-). Coconut oil: Coconut Oil is a great natural remedy to sooth dry and itchy scalp. Packed with antioxidant and saturated fatty acids, coconut oil penetrates scalp skin to moisturise and soften, and reduce itching and inflammation. Coconut oil also has some antibiotic and anti-bacterial properties which will keep your scalp healthy and itch free. Amla: Amla or Indian gooseberry is one of the most revered fruit since ancient times. In traditional Indian culture, amla is considered a valuable hair tonic and forms a regular part of hair care ritual. Amla is an antioxidant having high content of vitamin C, minerals, amino acids, flavonoid and tannins. This wonderful berry acts as a natural conditioner, minimizes hair loss and greying, and improves texture and thickness. It is has antimicrobial, antibacterial, and anti-inflammatory properties that help prevent inflammatory scalp condition, and keep dandruff away. Together, amla and coconut oil form a powerful blend and will look after your scalp and keep you dandruff free. To extract the amla juice: begin by grating half amla and squeeze the juice out from the grated amla (discard the pit). Enjoy the remaining half as a snack sprinkled with salt and pepper! Add about 1 to 2 tablespoons of coconut oil into the juice. Place amla juice and coconut oil in a bowl and mix well. 2. 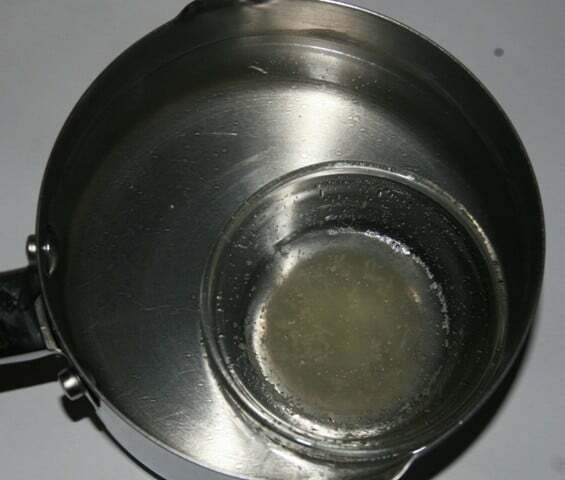 If your coconut oil is solid, stand this mixture in hot water for about 3 to 4 minutes, or until the coconut oil melts. 3. Apply the mixture evenly on the scalp, and massage gently using your finger tips. 4. Leave on for an hour and then wash off. Amla can be found in Indian stores or you can buy it online. If you can’t find fresh amla, then use amla powder, and it is equally effective. Garg, A. P., and Muller, J. Inhibition of growth of dermatophytes by Indian hair oils. Mycoses, 35, 363-369 (1992). Can I use frozen whole amla and put it in the food processor and use it on my hair directly instead of juicing it? Also my scalp is allergic to coconut oil, so can I use organic shea butter instead.. Thank you. Hi Summy, Yes you can do that, only thing is that the amla bits can remain in your hair. Use olive oil or shea butter if you like. For dandruff, you can also try miracle hair mask or ayurvedic hair mask. Hii Maam How much amount of amla juice and coconut oil to be mixed?? 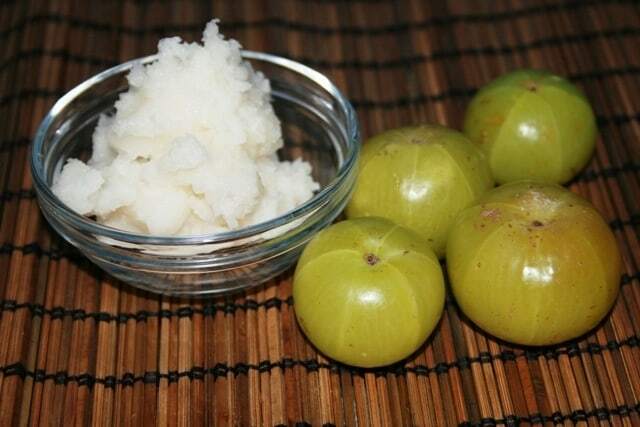 1 tablespoon amla juice and 1 to 2 tablespoon coconut oil. This homemade shampoo is very good. You can use parachute oil with amla juice. I haven’t used it. Look at the resource page I have listed some shampoos. Hii Only Amla Juice Is or Coconut Oil With Amla Juice? ?Which Is Gud?? Can We Use Parachute Coconut Oil For That?? basically my body has excess heat and becoz of it i am losing lots of hair(150-200/day) inspite of using reetha as a shampoo, and i use it thrice a week. Is there any problem using only reetha as a shampoo?? 2)i tried every home method to curb my hairfall but of no use…but i didnt try the above method(amla+oil). but,if tried,what herbal shampoo or mild shampoo will have to use and plz mention the name..
Hi Abhishek, you can use just reetha as shampoo. Is cocoa butter and rhassoul clay available where you live? can i use coconut oil mixed with dry Amla, Ritha, Hibiscus, mehandi leaves, Neem leaves all together. yes you can, just replace reetha with shikakai. The place where I am living, amla is not found very frequently… One can get amla very rarely… So, for the above remedy, is there any other alternative for amla to mix with coconut oil and use it??? Hi Bebo, You can use amla powder or triphala powder. Also try aloe vera gel, if you have a aloe plant that would be great, because most of the market brought aloe gel has preservatives and other stuff mixed with them. Thanks a lot mam, pure amla powder is a bit difficult to find, but I’ll try my best!! Bebo, you can make amla powder at home. 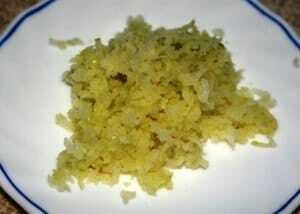 Grate amla, let it dry in the sun, then grind it into a fine powder. Make a small batch first to see if it works ok.
Hi Mam, what if I apply the above mixture on my hair and keep it overnight instead of one hour? Will it work better?? Will doing so have any side effects?? Bebo, Yes you can leave it overnight, one hour is the minimum you should keep. Btw, you please add an article to make hair straight without harsh chemicals naturally!! Hi Bebo, You cannot straighten curly hair. But you can look after it well, so it is healthy, shiny, and soft. And according to me healthy hair is the most beautiful – whether it’s straight, curly, wavy, short, or long. Mam, I used amla and coconut oil as kept it overnight. The dandruff is there still (only a little but i think regular use will vanish it off completely).. But the best part about this is that my hair fall…. It has reduced a lot… lot…..lot!!!!!!!! I never found any anti hair fall products useful.. But this is awesome!! My hair fall got reduced by approx. 90%..!! Keep posting mam..!!! You are doing an awesome work!! Hi Bebo, Thank you for your kind words. Let me know if your have any more questions. Hi Bebo, Check if this product contains mineral oil, if it does then don’t use. Always read the ingredients: if the product contains mineral oil, artificial fragrance, written as perfume, and other synthetic ingredients please do not use them. I m really impressed with the way you have motivated through your hair tips. Whenever, I apply oil a lot of hair come out (aound 10-20), when I wash again (around 30-40) and (I massage when hair is wet) similarly when I comb once hair becomes dry (around 30 – 40). This has started recently. However, my temples had almost gone bald last year but there is new growth (Prior to this 1 year back had smoothening and did not apply oil during this time. Also, had suffered from anxiety issue and had panic attacks during this year). This year again hair has started falling but not from the temples, its overall, I do not take any medicines and my anxiety issue has almost resolved. Please confirm if this is normal. Hi Konica, It’s normal to lose about 100 hair every day. Continue hair massage and make sure that you use pure hair oils – ones that are free from mineral oil, preservatives and artifical parfums.